Although very small in stature, this little amp head boasts an amazingly big 5 watts of 6L6, class A tube tone. It features gain, tone and master controls on the front panel and an 8 ohm speaker out on the rear. Also included is a speaker mute switch and a line out socket with level control for recording or plugging into a PA system. It comes fitted with a 6L6 power tube giving the Angry Ant a massive power output of 5 watts! Preamp gain/overdrive is achieved by cascading both the Angry Ants low-noise 12AX7's triodes and is controlled by the Ant's gain control. The master controls the loudness of this amp and also the saturation of the output tube. Turn the gain and master to full and this little amp gets quite loud and angry for such a little Ant! All Tube Technology: Using 1 selected 12ax7 tube and 1 selected 6L6 power tube. Preamp section: 1 guitar input feeds a 2 stage cascaded preamp section with gain, tone and volume control. Power amp section: Singled-ended 6L6, self-biasing, power pentode output stage producing 5 watts of pure class A tone. Master Volume: Post- preamp master volume controls output volume and allows preamp to be gained up for a fatter, dirtier tone. Speaker Output: 1 only, 8 Ohms. Line Out: Socket is also featured, taken from the speaker out via the level control. Power Switch: 3 way, off, standby and on. Blue Illuminated perspex front panel: for that "glow in the dark" effect. Transformers: are, high quality, hand wound, using vintage transformer winding techniques, grain oriented steel for superb sound quality and reliability. Quality Component: Using orange drop caps, carbon resistors and ceramic tube sockets. We also use quality hardware such as Carling switches, Cliff sockets and Alpha pots fitted with chicken head knobs. Chassis is 1.6mm aluminum extrusion with machined sides. Also featured is an engraved, illuminated clear perspex front panel. Hand Made Quality: All Sherlock Amplifiers products are made by hand, ensuring the highest quality of construction, which means they sound fantastic, are extremely reliable and will last a lifetime. Well the Angry Ant had to happen, it was a product waiting for completion. After making so many little single ended low power tube amps for guitarist and harp players over the years, most of them built into stripped reverb tank chassis, (what was I going to do with all those broken reverb tanks?) I knew I was onto a winner. 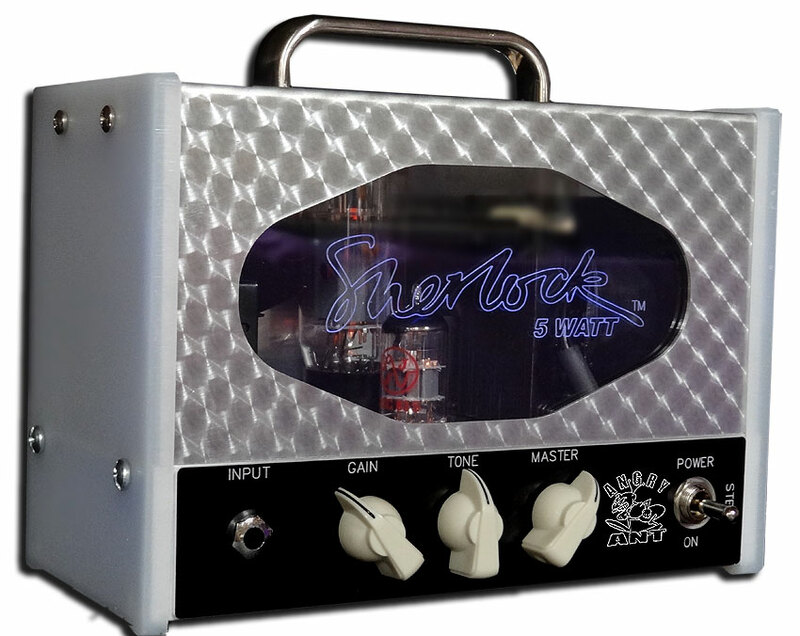 As the popularity of little amps continued to grow, I knew that the Sherlock product range would not be complete without the Reverb Tank amps re-birth....... the Angry Ant. And a big thanks to Steve from StevieJNorth for his input into the product.